He can roll out of bed, stumble out the front door, and practically land in a pretty little trout stream. You can't ask for much more than that in a mountain hideaway. My thanks to my Neuse wading buddy John for inviting me up to see his trout shack and fish the Shelton Laurel Creek that's happily gurgling along in front of it. 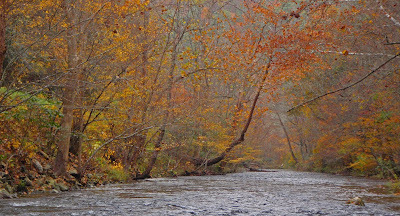 I got an early start and made the four hour drive up into Madison County, a beautiful trip with the brilliant fall colors just starting to fade to brown, to try once more to prove how poor a trout fisherman I am. 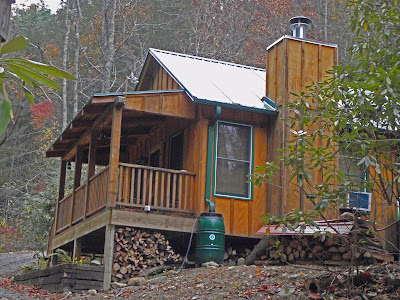 I met John on the road and followed him up some twisty gravel roads that would challenge a mountain goat to his one-room cabin, perched high on a hill overlooking the Shelton Laurel, a fine little delayed harvest trout stream. Despite running a little high, the Shelton Laural was easily waded, clear enough to survey the stream bed, and looked very, very fishy. You couldn't have asked for a better fishing day; cool, not cold, overcast, not raining; perfect for fish and fisherman alike. Unfortunately, it wasn't as great a catching day, unless you count the seemingly hundreds of leaves I snagged throughout the afternoon as they rained down around us and floated happily down stream. We were able to scare up a handful of small rainbows and each managed to miss a good fish or two, mine for bad drift management, seeing the silvery flash of a strike but having too much slack floating line between me and a decent hookset. 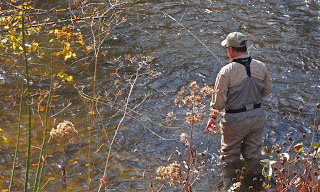 While we threw a lot of patterns, the only luck I had all day was when downstream swinging a white woollybugger in the high, swift water. It may not have been classic trout fishing, but you do what you gotta do sometimes. John was a terrific host, pitching in a fine Lexington barbecue lunch and a little history about the area, including the Shelton Laurel Massacre. As darkness settled in, I crawled back down the goat paths for home once again, and put in four more hours on the road. But equal time fishing and driving is a day well spent, I believe, so the trip was easy and worthwhile. My thanks again to John for the invitation and great hospitality and I look forward to trying the Shelton Laurel again before too very long. Looks like a great day was had. I really do enjoy reading your posts. If only, to see some of the state I had to leave because Uncle Sam told me to. Thanks for the memory of Lexington barbecue. I cannot wait to come back to North Carolina. If only to visit. I can guarantee I will have some fishing gear with me when I do come visit. Keep the great stories coming. Thanks Parker, and be safe man. We appreciate all you and your mates do for us.